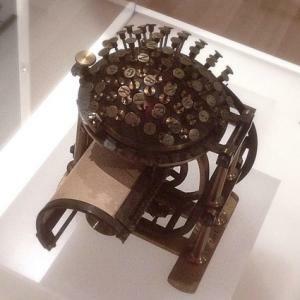 The "type writer" revolutionized business, art and correspondence, and despite (or because of) a century of changes, earlier writing machines are still avidly sought by collectors. If you have ever been tempted by a typewriter, or struggled with "The quick brown fox," you'll need some information to guide you in your search. Hundreds of different vintage and antique (100 years old or more) typewriters are on the market, in conditions ranging from nearly new to "Why are the keys missing?" Unlike other antiques and collectibles, determining the value of a typewriter is tricky: as collecter and typewriter expert Tony Casillo notes, there are no major marketplaces solely for old typewriters and office machines, although a few dealers offer listings, like this one for the Sholes-Kortsch collection. Over the past few years, typewriter values for many models have remained under $400, as shown by price guides such as WorthPoint and Kovels and noted by typewriter collectors, such as Mark Adams. Typewriters were in just about every home and business by the 1920s, and the machines were expensive in their day, making some of them a bargain for modern buyers seeking a link with technology of the past. Odd doesn't always mean rare. Some examples, like the Oliver, look odd, with wing-like groupings of type arms on either side of the machine. But more than a million machines were manufactured with selling prices of under $400 for early model No. 5, as listed in Worthpoint. Vintage and antique typewriters can be repaired, and unlike other antiques, new parts, repairs, and even paint touch-ups don't faze typewriter collectors. While a typewriter may look rusty, dusty, and broken, it may have value to a collector just because she can fix it and the price may be higher than the condition of the machine suggests. Because there were so many different typewriter manufacturers and typewriter models, collectors will come across early examples with odd shaped (or organized) keyboards, brass plated casings, or even fancy inlay work. The value of these models are generally higher than the plainer versions, such as the Blickensderfer Model No. 7 that sold for $1,500 in 2013 on eBay. Earlier models command higher prices, but how much higher depends again, by who wants the machine at that time. Typewriters are valued by physical and mechanical condition and rarity. A working, rare example brings the highest amount: the Writing Ball sold for $123,125, a world record in typewriters, but most examples you will come across are under a century old. In addition to those listed below, there were scores of other typewriter manufacturers across the U.S. and around the world, with some companies producing more than one million typewriters in their heyday. Although there are rarities tucked away in attics, expect to find interesting, engaging, and sometimes working, machines for $100 and under. According to author and typewriter expert Richard Polt, many typewriters you will come across are from several known brands. Basic pricing ranges are based on eBay auction searches, along with WorthPoint and Kovels guides. 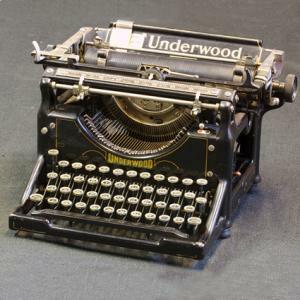 Underwood (1897) was first produced by the Wagner Typewriter Company, later purchased by John Underwood. Early Underwood models can sell for more than $1,000, with examples from the 1920s bringing up to $500 and 1930s, $300-400. The Underwood No. 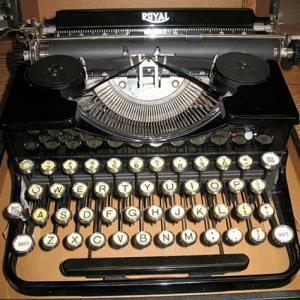 5 Typewriter page lists serial numbers and production information about the typewriters. Later examples sell for $50-75, as shown in online auctions like eBay. Remington (started in 1873, with Model 1) began as E. Remington & Sons (the company also manufactured guns.) 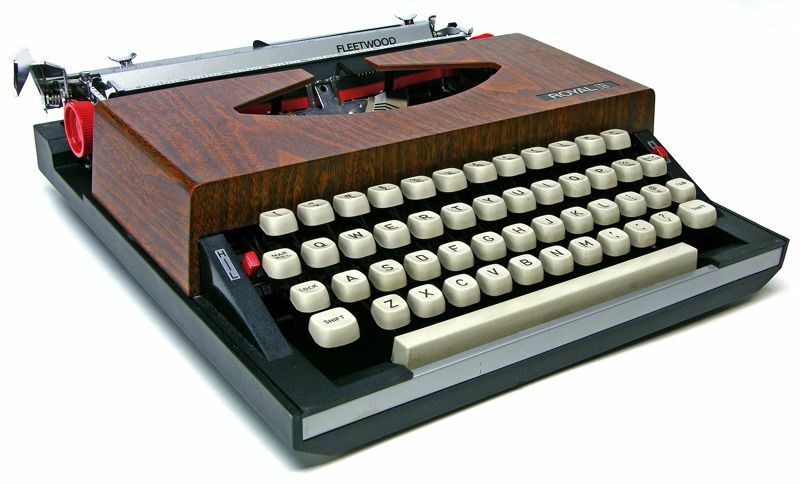 According to The Typewriter Database, the first Remington model was listed as "No. 1 Old Style" in the company records, and originally sold for $47.50. It did not use lowercase letters. 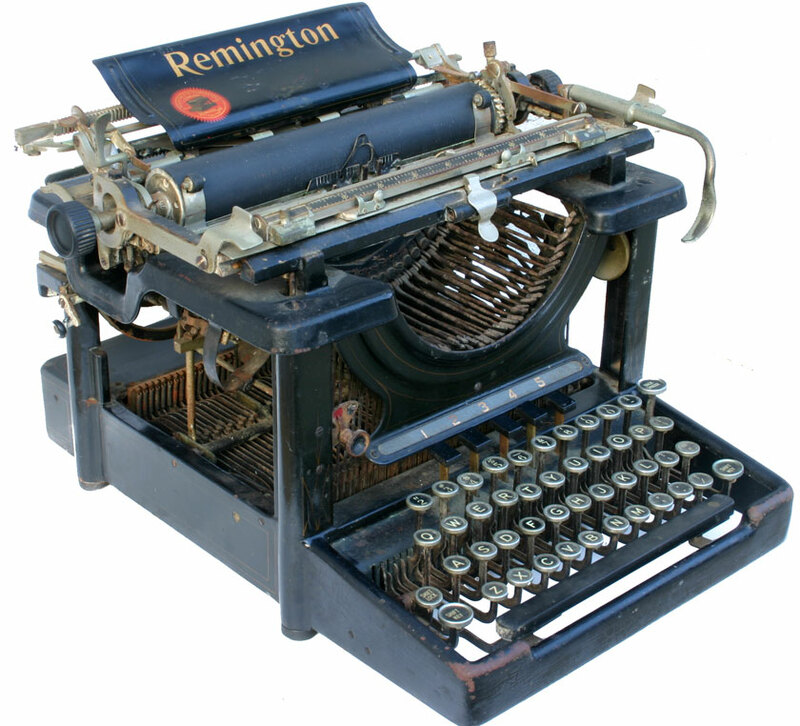 The first Remington portables appeared around 1920. By 1930, the Remington Standard #10 had been modeled so that you could see the paper as you typed (known as a "visual typewriter".) In July, 2014, a Remington No. 1 in rough condition sold for nearly $27,000 at auction on eBay. But later Remingtons, including the Standard #10, can be found online for $150 and under, in good, working condition. Oliver typewriters were made in Chicago, IL, beginning in 1895. The company was best known as the first manufacturer of practical visual typewriter. The machines were "downstrikers", where the typebars (the arms that hold the letter or symbol) hit the paper from above. Most modern typewriters are front strikers; the upstrikers were arms that hit the paper from below. Oliver typewriters from the earliest period command up to $125 for examples in good condition. Vintage Olivers can be found for $75 and under. Corona (1903, when Smith of Smith Corona opened) produced many different typewriter models. As with Remington, the manufacturing arm of Smith Corona produced guns. Some of their earliest typewriters were elaborate confections of metal arms and a circular type section; these have sold for $150 and under. 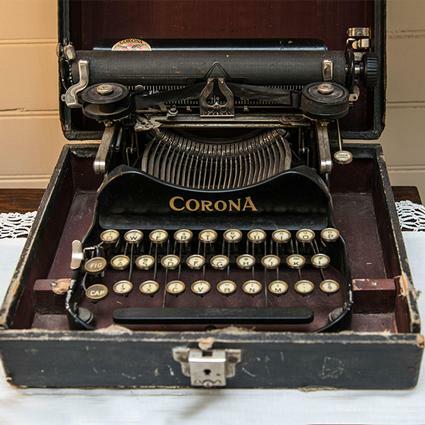 When the Corona 3 typewriter was made, it was popular because it folded into a smaller size for easier transport, and working examples can sell for $100 and under. Also watch for children's typewriters made by this company, and expect to pay for $100 or more for an example in excellent condition. Royal Typewriter Company was located in New York City and Hartford, CT, beginning in 1904. Royal typewriters were sturdy, easy-to-use machines that didn't jam, and among the first to be touted by writers and journalists. So many Royals were produced that even the earliest examples sell for $100 or less. The Fleetwood had a Danish Modern touch. 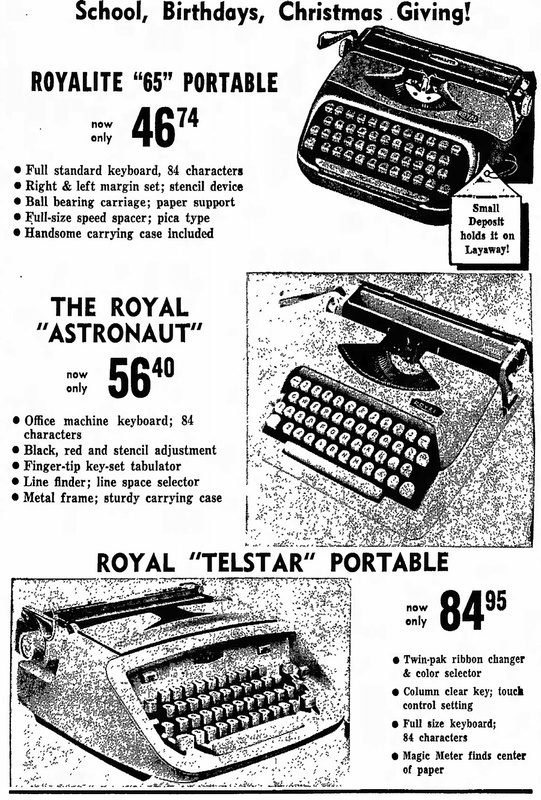 Watch out for the Royal Astronaut, a colorful typewriter with a plastic case meant to evoke the new world of space exploration in the 1960s, an example that will set you back $50 or so. 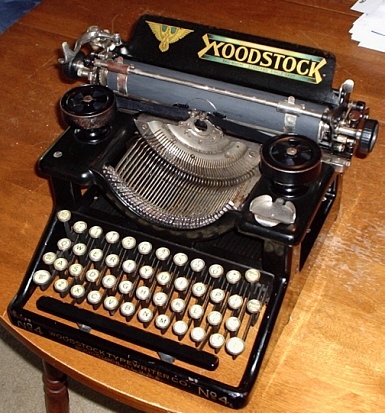 Woodstock Typewriter Company was located in Chicago, IL, and was known for its well-made machines. The company hit upon an unusual marketing ploy: everyone who purchased a Woodstock machine had to offer a testimonial, and the accolades were then printed on future brochures. The Woodstock Company was successful: even today, vintage examples sell for $50 or less. Decals should be in good condition, and readable. Watch for extensive rust, which can be difficult to remove completely, leaving pitted surfaces or weakened parts. Mechanical parts should be in place and original. Other typewriters have been reconditioned in the past, so the repair may be nearly as old as the machine. The plating should be original and unpitted. All machine parts should work: the roller should move, the keys should strike, the return arm should work, and of course, the bell should ring. You can perform many basic repairs to older typewriters, including cleaning, lubricating and replacing minor parts (screws), and there are many suggestions from Richard Plot and friends at Basic Typewriter Restoration. If you don't know what you have or you want to know more, a visit to The Typewriter Database is a first stop. This amazing resource includes company histories, serial numbers, and other information for typewriters both scarce and common. 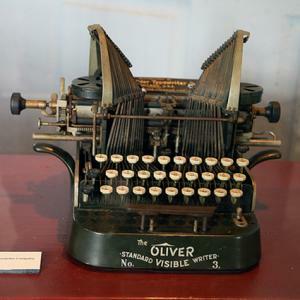 The Typewriter Museum lists more than 125 typewriters, with photos, hyperlinks and descriptions from Adler to Xerox. The Classic Typewriter Page has an extensive collection of articles about early typewriters, along with photographs and details for each machine. Machines of Loving Grace offers online manuals for collectible and rare typewriters, and amazing photographs of Royal machines. Two invaluable books for collectors were written by Michael Adler: Antique Typewriters, from Creed to QWERTY, which includes a price guide, and The Writing Machine, which is out of print, but can be found on used book sites. Actor Tom Hanks is an avid typewriter collector, and Collectors Weekly's article about his hobby, and how other collectors view it, is worth the read. Finally, use your typewriters for some fun, and there's no better way to do so than making music with one.